Well, it might seem like I'm a bit obsessed with pesto at the moment -- and I am. I've always loved pesto, and right now it's pretty high on my list of favorite foods! 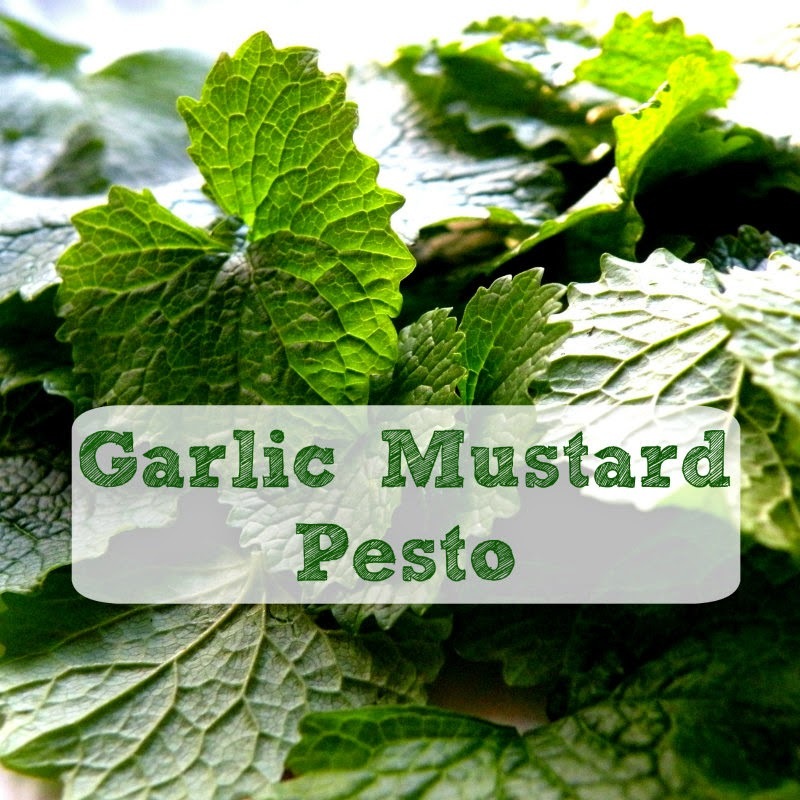 Most of us have heard of basil pesto, kale pesto, and garlic scape pesto... but what about garlic mustard pesto? In my area, we have garlic mustard all year round, even under the snow. Garlic mustard is a plant that grows over much of the United States. Originally from Europe, garlic mustard (Alliaria petiolata) was brought over by settlers as a culinary and medicinal herb. Unfortunately, garlic mustard has proven to be quite invasive here, displacing many native plants, harming the larvae of several native butterfly species, and preventing the seeding of local tree species. The plant is very difficult to eradicate, with seeds having the ability to survive in very inhospitable conditions. The best way to remove garlic mustard is by hand pulling or cutting down the plant before it goes to seed in its second year of growth. I think it's pretty clear that garlic mustard isn't good for our local ecosystems. But what garlic mustard is good for, is eating! 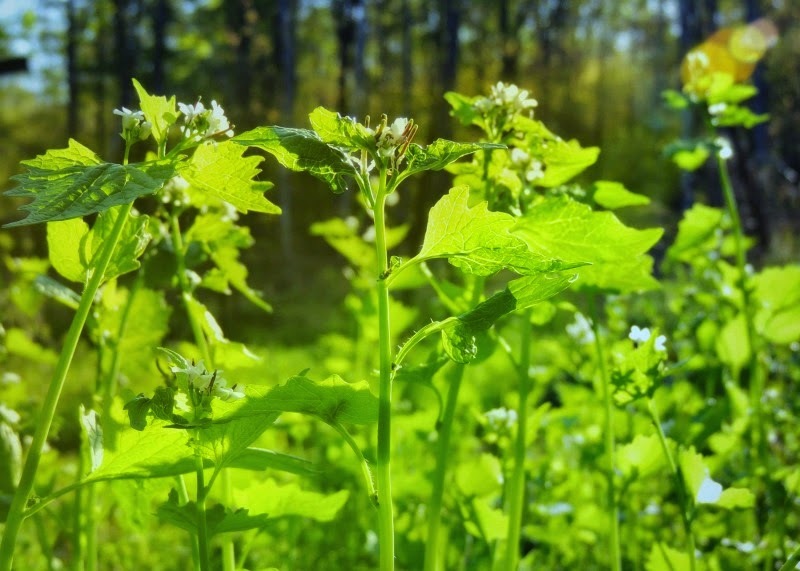 Garlic mustard has been used for thousands of years as a culinary herb. The greens of this plant contain vitamins A, C, & E, as well as potassium, calcium, omega-3s, magnesium, selenium, copper, iron, and manganese. For help ID-ing this plant, you can view more photos here. Be sure to gather your leaves from a clean area, that has had no pesticides, herbicides, or chemicals applied. Avoid areas next to roadways! - 3 Cups Garlic Mustard Leaves, washed & packed into your cup. 1) Pulse garlic mustard leaves, garlic, and nuts in a food processor until chopped. 2) Slowly add the olive oil and pulse until combined and smooth. 3) Add the grated cheese, pulse until smooth. 4) Taste, and season with the salt, pepper, and red pepper flakes. Serve with pasta, bread, or in sandwiches. Sounds great! Looking forward to the return of the garlic mustard this spring in the Blue Ridge Mountains, VA, this spring. It is a good one to eat!